Heat 1 tsp. garlic oil in skillet over medium-high heat. Add mushrooms, and cook 5 minutes, or until browned. Add tomatoes to skillet cut-side down, and cook 2 minutes, or until browned. Add remaining 1 tsp. garlic oil to skillet. Stir in shallots, and sauté 2 to 3 minutes. Stir in bulgur until grains are coated with oil. Add broth, thyme sprig, and 1 1/2 cups water; season with salt and pepper, if desired. Cover, reduce heat to medium-low, and simmer 5 minutes. Arrange bok choy halves on top of bulgur with leaves pointing outward (like spokes in a wheel). 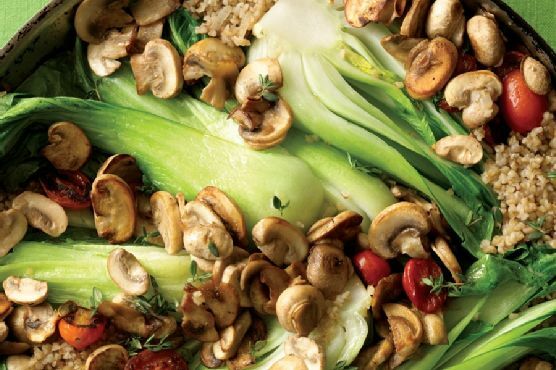 Sprinkle mushrooms and tomatoes between bok choy halves. Cover, and simmer 5 minutes more. Remove from heat, and let stand 10 minutes. Sprinkle with thyme leaves, and drizzle with garlic oil.